On an Island is Davidâ€™s third solo album and like the first album, it feature many references to his musical roots and inspirations. Itâ€™s an honest and laidback album allowing Davidâ€™s tone and playing to shine without too much trickery. The Black Strat is once again Davidâ€™s main guitar but he also using a wide range of different instruments including acoustic slide guitars and saxophone. Note: David is seen having several single stomp boxes laying around in the different studios while recording the album. 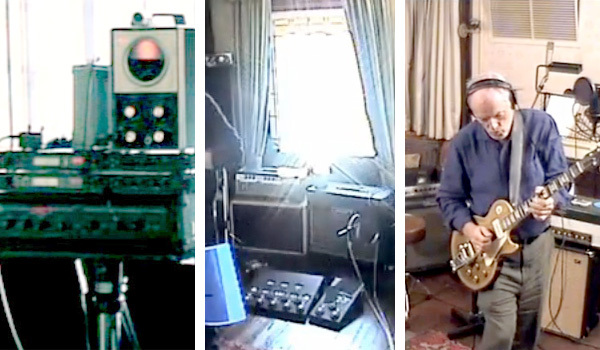 It is likely that he used different effects or single pedals when required on the initial demo sessions and later recording sessions than what is listed above. (left) David used a smaller version of the stage rack for the sessions featuring a Conn Strobo tuner, 2 Digitech IPS 33B harmonizers and a MXR Digital Delay II. (middle) Fender Bandmaster and Fender 2x12 speaker cabinet, Hiwatt SA212 50w combo and the Pete Cornish 1999 All Tubes pedal board in front. (right) David with the 1956 Gibson Les Paul Goldtop and behind to his right is a Marshall (unknown model) with a 1x12 speaker cabinet. The pedal board dates from 1999 and was requested by David to be used for future guest appearances etc. The board featured Cornish custom tube preamps between each effect to ensure minimum signal loss. It could also perform in both stereo and mono. Additionally the board was designed not to allow two distortion pedals to be engaged at once, only distortion+overdrive. The board was brought on a backup on the On an Island 2006 tour and later used for 2010 guest appearances. – 1969 black alder body with black pickguard, Fender 1983 â€˜57 reissue maple neck and Fender â€˜71 neck and bridge pickups and a Seymour Duncan custom SSL-1 bridge pickup. – Take a Breath recording sessions. – This Heaven recording sessions. – Open Em chord tuning (E B E G B E) for Then I Close My Eyes and Smile. – Tuned as a guitar. – 2x 12â€³ Eminence speakers and 4Ã—12AX7, 2xGT6L6 and 2Ã—5U4 (rectifier) tubes. – 2x 12â€³ Fane Crescendo speakers and 2xEL34 and 4Ã—12AX7 tubes. Modified to allow a normal and brilliant input combination. – Abbey Road recording sessions. David is also seen stacking a huge variety of guitars and amps for the sessions and might have used different setups on both the initial demo sessions and recording sessions than what is listed here. 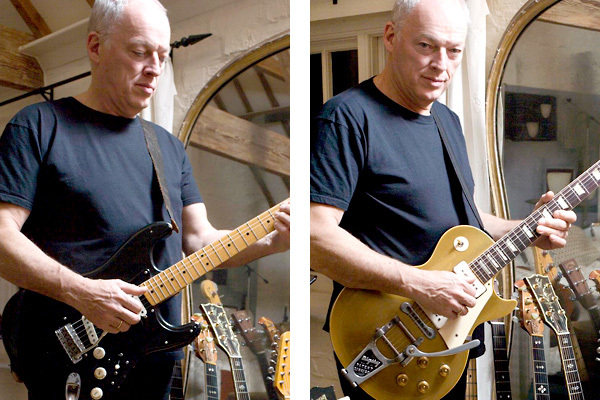 David pictured in his home studio with the main guitars that were used for On an Island - the Black Strat and a 1956 Gibson Les Paul Goldtop with Bigsby tremolo system. (left) A 1950's Gretsch Duo Jet. David got the guitar around1976-77 and has used it on several albums since. The guitar was featured on Then I Close My Eyes and Where We Start. 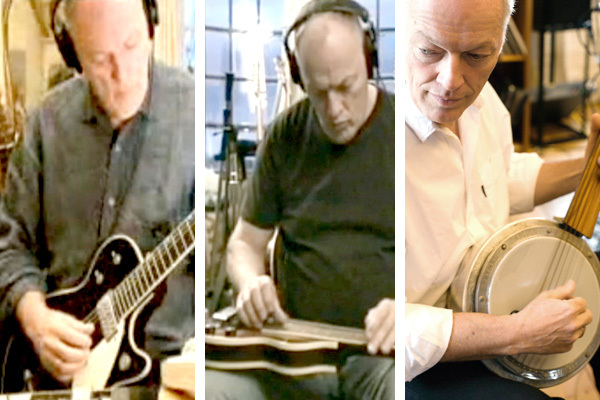 (middle) David's main slide for the album, a Gibson 1940s EH-150 lap steel. (right) This Turkish Cumbus was used for the opening of Then I Close My Eyes. David used Herco Flex 75, Dâ€™Andrea custom 354â€™s (white), Fender 354 (tortoise) and Fender 351 (medium) pics. All electric guitars were strung with GHS Boomers (custom set 0.10-0.48) and acoustics with Ernie Ball Lightwound strings. Davidâ€™s main setup for the sessions was a Fender Tweed micâ€™ed with a Shure SM57 slightly off center about 4″ away and a Coles 4040 ribbon straight at the center of the cone (The Shure was mixed slightly higher). All instruments were connected with Evidence Audio speaker cables. See these in-depth features for more on Davidâ€™s gear: Big Muff, The Black Stratocaster, The Red Stratocaster, Gibson Les Pauls, Slide Guitars and Hiwatt amps & WEM cabinets. On an Island (album 2006), Remember That Night (concert film 2007), EMI EPK presentation, davidgilmour.com, demeteramps.com, tonefromheaven.com, Sound on Sound Magazine (2006) and â€œThe Black Strat â€“ A History of David Gilmourâ€™s black Fender Stratocasterâ€ by Phil Taylor. Thanks to Rafal Zychal, Martin Campbell, John Roscoe and Tony Farinella for help with research.